This action will delete the specified directory. If Delete Tree is set then the action will delete any files in the target directory, if not then the action will fail if the directory is not empty. If these options are set, directories will be deleted even if they have their "Read Only" or "Hidden" attributes set. Otherwise, attempting to delete such directories will result in an error. 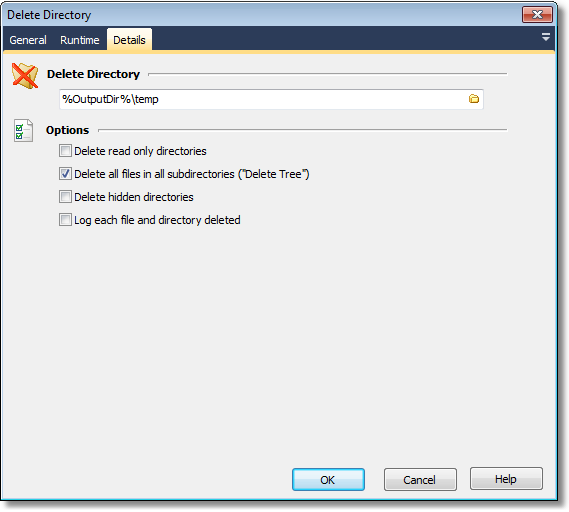 If Delete Tree is set, the action will recursively delete all files and subdirectories of the chosen directory. If this option is set, the pathname of each file and directory will be logged as it is deleted.